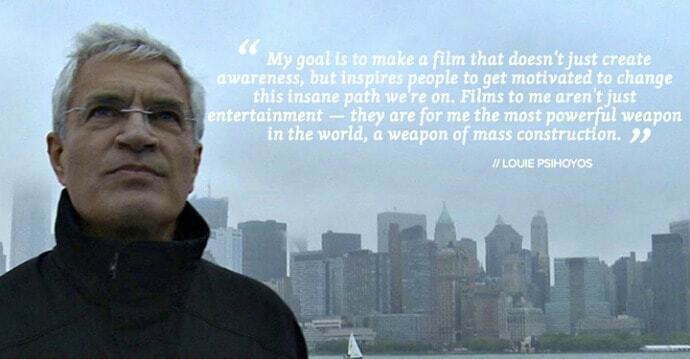 Louie Psihoyos changed my life. I’d known about the importance of ecotourism and conservation since 2000. But it was Psihoyos’ 2009 directorial debut, The Cove (which won the Academy Award for Best Documentary) that showed me the difference solid storytelling could make in confronting complex environmental issues. Along with Al Gore’s An Inconvenient Truth, The Cove made me want to write stories that truly mattered. Now Psihoyos (a veteran National Geographic photographer who co-founded the non-profit Oceanic Preservation Society) is back with an essential documentary six years in the making. Racing Extinction follows the director and his passionate team of activists as they expose two major threats to endangered species around the globe– climate change and the international wildlife trade. Once again Psihoyos and Co. put themselves in harm’s way in pursuit of their story, going undercover to bust an illicit ring of wildlife traffickers in China. Once again they offer long-term sustainable solutions to devastating problems, educating Indonesian villagers on the economic benefits of conserving Manta Rays rather than killing them and educating viewers on lowering their carbon footprint. The results are informative, inspiring and way more thrilling than the new James Bond flick. 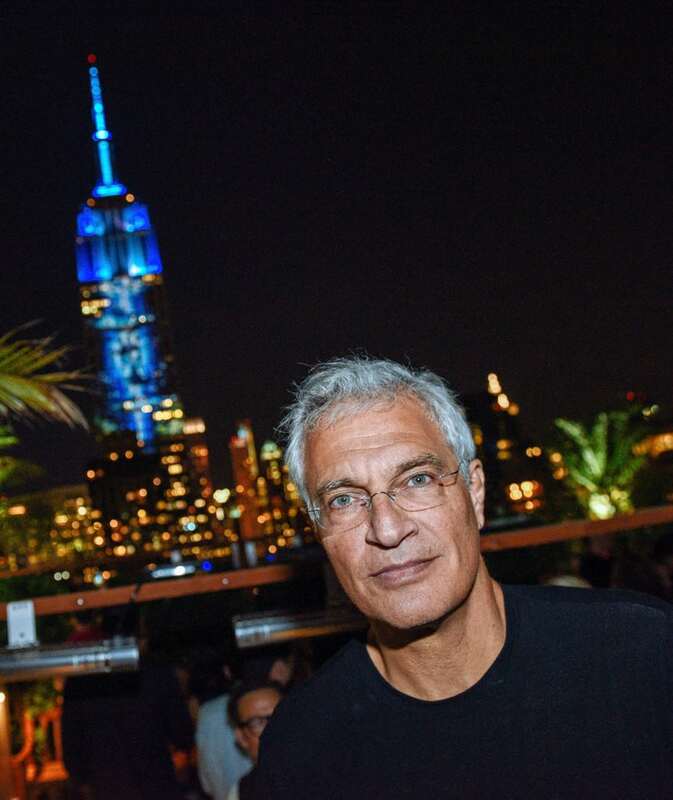 I was honored to have a chance to speak to Psihoyos a few weeks before Racing Extinction makes its December 2 premiere on the Discovery Channel. How has the success of The Cove impacted your life and career? It was life-changing. 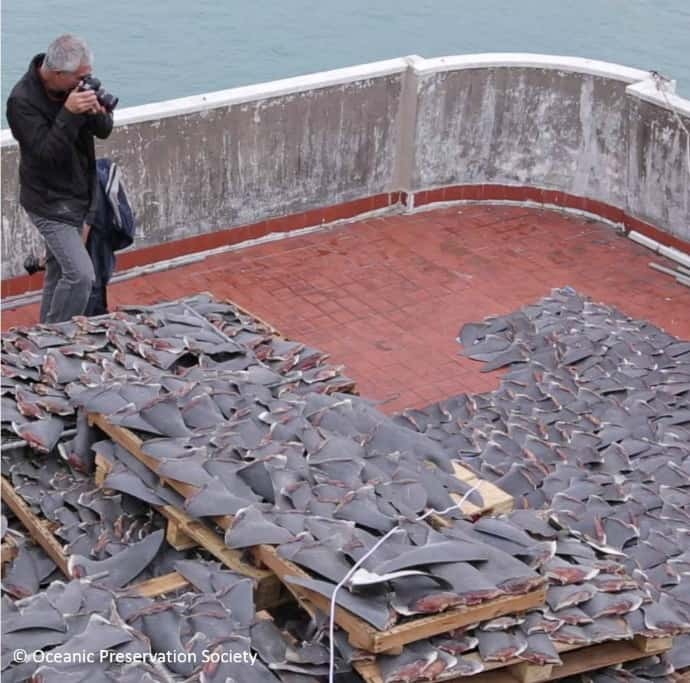 When we started making the film, they were killing 23,000 porpoises and dolphins a year. Last year, they killed less than a sixth of that. I think the ongoing drop in cetacean deaths in Japan is huge, spurred in part by other movies like Blackfish. And the campaign has continued: We still work on dolphin and captivity issues. It also made me think, if a film can have this kind of impact on a small scale, can we scale it up so that we can avoid a planetary disaster? 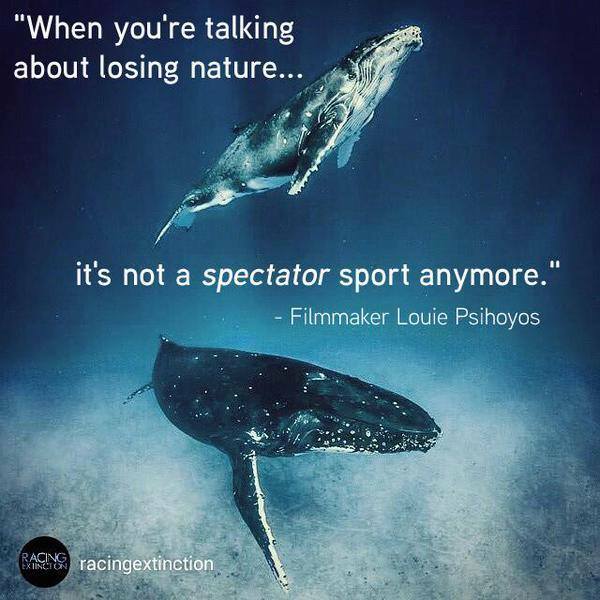 Racing Extinction is about a much bigger topic. The Cove was about one species and one body of water. We talked about a lot of problems associated with the oceans, but it really was a small-scale problem compared to humanity causing the loss of half the species on the planet. It gave me the belief that films can change the world. That is what we’re trying to do with this new film. 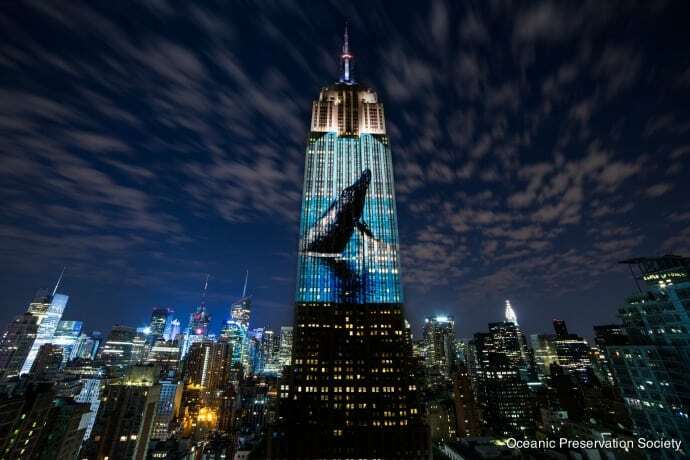 How did you organize Racing Extinction to focus on so many important issues, from the illegal wildlife trade to carbon emissions and global warming issues? Saving the planet is a little like surviving a car wreck. What’s the one thing I can do to save myself in a car wreck? Well, there’s not just one thing. You can wear seat belts, slow down in the rain and snow… there are a lot of things you can do! With mass extinction, there are four different drivers– habitat destruction, pollution, invasive species, and overconsumption. We try to address all four of those in the film, and talk about what some of the possible solutions are. Much like The Cove, this is an eco-thriller. I wanted to make a film that I would want to go see, not just a lot of dry exposition. I think if the film is exciting and if I’m excited to do it, then the audience is going to be excited to see it. It doesn’t have to feel like a documentary. As a filmmaker, how do you deal with the challenges of putting yourself in situations where you could be arrested or hurt… or something worse? The best thing that you can hope to happen when you’re doing a film is to get death threats, because then you know you’re creating change. We got death threats on The Cove, but Racing Extinction was a much more difficult film to make in terms of risk because we were directly confronting the perpetrators, posing as buyers of endangered species. In The Cove, we were infiltrating a place that was very difficult, if not impossible, for other conservation groups to get into. That certainly had its challenges. But we were mainly doing that at night, like a break-in, and we didn’t get caught, thank god. This situation was different because we’re role playing. It’s like you’re infiltrating the mob, undercover, and you’re all wired up. It was just as exciting and scary as it looks. We are definitely in [illegal wildlife traffickers’] territory, not ours. We found so many illegal shark processing plants in Puchi, China, and our film has already closed down six of them. 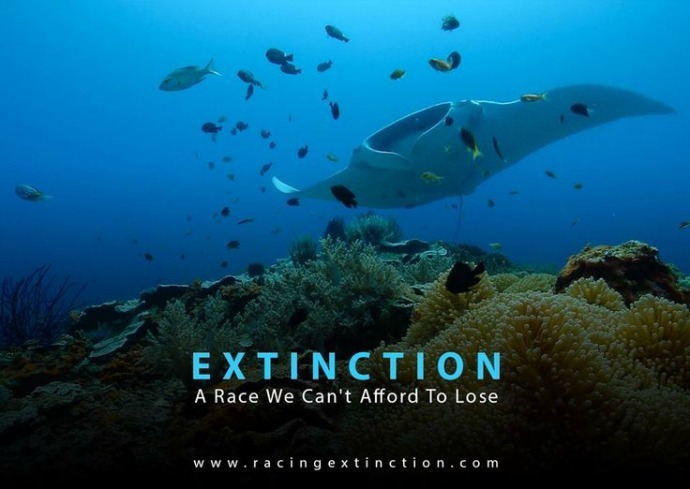 What are your Big Picture goals for Racing Extinction? One of the main premises of this film is that everybody can make a difference. One of the major factors of this mass extinction is the eradication of natural habitat to grow food for animals that we’re going to eat. By reducing our global meat consumption, we can have a huge impact on the extinction of wildlife. The amount of carbon dioxide we’re creating is acidifying the oceans’ reefs at an incredible rate that we didn’t realize was happening until 2003. About 1/2 to 1/3 of the CO2 that we create is absorbed by the ocean. We used to think that was a good thing. But with the current rate of acidification, all coral reefs will be gone by 2100. When you lose the coral reefs, you lose about 25% of the species in the ocean. The fact that this huge concentration of wildlife could be gone in just a couple of generations is unconscionable to me. So we want people to realize that there’s a large-scale planetary disaster going on. We’re losing more wildlife at a great pace than we have since the comet hit Earth 65 million years ago, but this time humans are the asteroid. When you were in China, did you see things beginning to change? Are you hopeful that we can actually win this race and stop a mass extinction from happening? Absolutely! WildAid is a terrific organization. Through their campaign with Yao Ming, they’ve been able to help reduce the consumption of shark fins in China by 70% in the last three or four years. Four years ago, they were struggling to get Manta Rays on the endangered species list, but they did. Indonesia, which was killing more Manta Rays than any other place in the world, is now home to the largest marine sanctuary in the world. So you see that change can happen very quickly. And it usually begins with a small group of passionate people. Everybody can make a difference. You don’t have to make big changes. Even small changes make a difference. The average person eats over 10,000 animals in their lifetime. The raising of beef for consumption creates more greenhouse gases than all of the transportation system’s emissions combined. If we convince even one person to stop or reduce eating meat, it has a huge affect. One of my favorite quotes from the film is “The best way to move the needle when talking about the environment is the bottom line.” How were you able to convince a fishing village in Indonesia that tourism could bring in more money than killing Manta Rays? Even when you consider the amount of money whaling brought in from the 1800s up to now, whale watching has historically brought in far more revenue than whale killing. They’re worth way more in the water than they are on the butcher’s block. It is the same with Manta Rays, if you can turn that economy around to a tourist economy. A Manta Ray swimming is the most beautiful animal I’ve ever seen in the ocean. The economic benefit of each living Manta Ray could be a million dollars if you create a good tourist economy. On a butcher’s block, it’s worth about $500. But then they can’t propagate after that. That quote you mentioned came from Tony Malkin, the owner of the Empire State Building. They spent about $20 million to green the building a few years ago. Not only did that investment pay off in four years, but he’s going to save $4.5 million annually on energy costs. He was also able to double and triple the rents, because the greening of the building made it more livable. People liked going to work there, and that makes the building more desirable. Can you talk about what you’re trying to do with the #StartWith1Thing campaign? I think everyone feels like, “How can I make a difference? I’m just one person!” But if everybody takes small steps, it adds up to a lot. For instance, if everyone in America adopted a plant-based diet just one day a week– without meat, eggs and cheese– that would be the equivalent of taking 7.6 million cars off the road permanently. Installing solar panels on your home could save enough fuel to drive a car more than halfway around the world each year. It has a huge effect when people make small changes. Was there a strategic reason for doing this movie for TV versus a theatrical release? It’s very difficult to make money on a documentary. You only do it to bring attention to the subject via reviews and awards. Discovery is the biggest network in the world, providing access to 2.4 billion people. 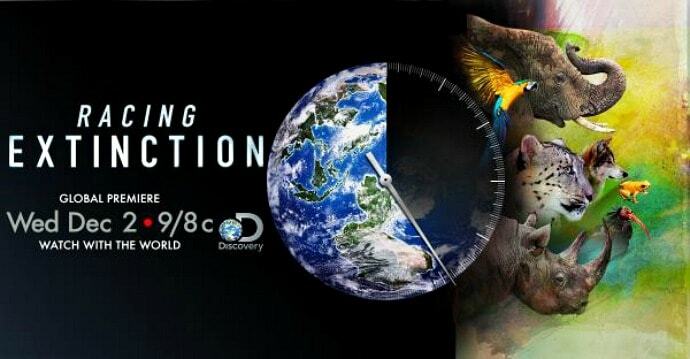 They’re going to be releasing Racing Extinction on Discovery and Animal Planet simultaneously at 9 PM on Dec 2, and we’re hoping to get a billion people to see this film. We’re trying to start a movement, not just make a movie. I can’t think of a better partner than Discovery, because of the massive weight they put behind it. There are non-stop ads for the film on their networks,and we’ve been working with them for about two years on RacingExtinction.com. After people see the movie, we want them to know what they can do to help stop the mass extinction event and save endangered species.